Poor college student attempts to make two bentos a day. Easily one of the best things about living in Japan, even for a non-Japanese speaking yonsei like myself, is going to any of the seasonal celebrations (I am a fan of the cherry blossom festival) and gorging on all the delicious festival foods. Of those, taiyaki is probably my favorite. Taiyaki are basically slightly crunchy, filled pancakes. They traditionally come in the shape of a fish, although simpler hockey puck (imagawayaki) ones are also popular. Pretty much all of the taiyaki I had in Japan were filled with azuki bean paste but there are ones filled with various sorts of cremes as well. My fiancée loves taiyaki as well and she has been pestering me to learn how to make them. I have seen taiyaki molds at several Asian stores but your best bet is to look for one at a Japanese specialty market. We got ours from a Marukai during a recent visit to Los Angeles and it looks identical to basically every other taiyaki mold we have seen. We looked over a handful of recipes and settled on Mamaloli.com’s recipe because it did not require too many specialty ingredients. Our taiyaki mold, greased up and ready to make delicious. Enough preamble, let’s cook some taiyaki. As much as I like azuki bean paste, I know from experience that it is a process to make properly. Further, my fiancée loves the creme filled taiyaki. After some debating we settled on this Hawaiian style coconut pudding recipe. Sugar, coconut milk and a pinch of salt go into a pot on medium heat until the sugar dissolves. Shredded coconut is added and warmed until it softens up. In the future, we will probably give the shredded coconut a light toasting prior to adding it to fluid. In another bowl, whisk together equal parts water and cornstarch. Once the cornstarch is properly emulsified, pour it into the coconut milk mixture and continue to stir. The cornstarch should thicken the mixture instantly but we had to cook it for another couple minutes to get the yogurt consistency indicated by the recipe. When it has thickened to your liking, set the mixture aside to cool. Ideally, you want to have it chilled before you start shoveling it into your taiyaki. Next up, the batter. The batter is very simple and resembles pancake batter. The same principles apply to the taiyaki batter; whisk the dry ingredients together and then pour the wet into the dry. Whisk thoroughly and you are ready to pour. The taiyaki mold should be heated over a low-medium temperature, on both sides. 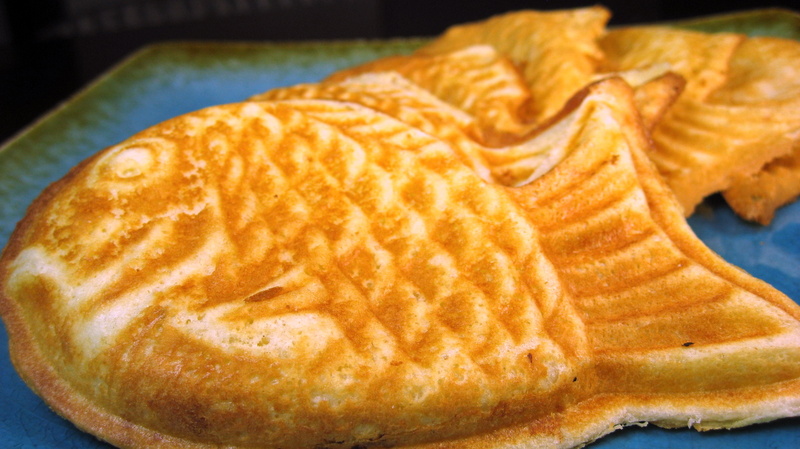 Our best guess is that you want to use about 1/2 cup of batter per taiyaki. That is definitely not a hard and fast rule though so play around with it. Do not worry too much about making sure the filling gets into every nook and cranny. If the pan is hot enough, the batter should rise and spread as it hits the pan. It takes some time to get used to this process so do not feel bad if your first few taiyaki come out shaped funny. Our experience showed that you want to add batter until it is about equal with the edges of the mold. Next, add the chilled filling. We found that 1-2 tablespoons appeared to be the proper amount. Too much filling will punch holes in your taiyaki and too little will make the taiyaki into a very ornate dry pancake. In the picture above, you can see that we put some filling in the dorsal fin. This will made the final fish look odd but otherwise did not prove to be much of a problem. A final layer of batter is poured over the filling. Aim to cover as much of the filling as possible but if some filling is still visible do not sweat it. We found that it was best to cook it over a medium-low temp and rotate it every minute or so. If your pan was hot enough and you oiled it up right, you should be able to pry the taiyaki off the mold and check both sides for doneness. The picture above shows what the taiyaki looks like just prior to being trimmed. From our own trial and error we identified four areas where taiyakis go awry. If you overfill, as I did in the picture above. Your taiyaki will burn onto the mold and then it becomes a pain to get it out of the mold, either to check if it is done or to get them out of the molds at the end. 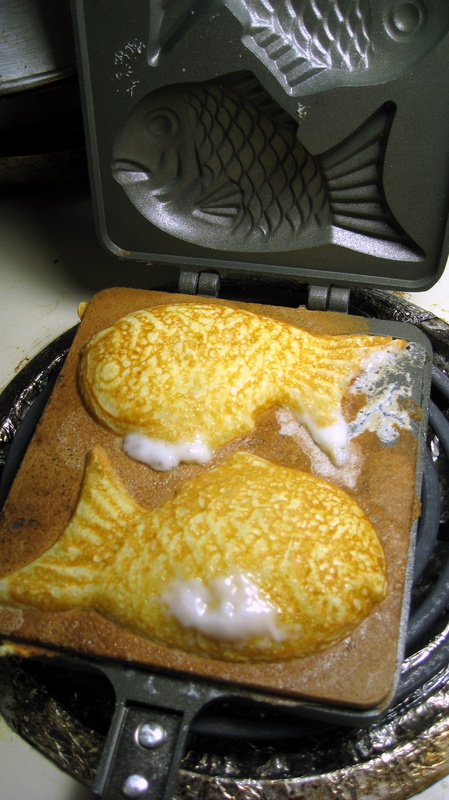 Also pictured above, is what happens if you cook your taiyaki to death. The filling will begin to boil out of weak spots in the taiyaki. They still taste fine but they just do not look as cool with bits of white fluid leaking out of them. If you under fill your taiyaki, as I have done in this picture, you will end up with sad finless fish that may or may not have filling oozing. Again, still completely edible, just not very cool looking. Your fish will also fail to rise if the pan is not hot enough when you pour the batter. More importantly, the pan must stay hot after you add the batter. We had a couple batches of taiyaki that lacked fins and I concluded that this was because the batter never expanded to fill the periphery. If you rotate the closed mold immediately after pouring it will fill in the edges better. Those are the four basic problems we ran into while making taiyaki. As you can see from the picture below, you can totally use your two good taiyakis to hide their misshapen brethren. ^^I always forget my smile can’t have a nose without looking shocked on these things. Yeah… They’re much cuter in theory. That’s why I always start eating them from the head. For the record, The Fireninja’s Wife should so be a movie. If you have any Asian specialty stores you should be able to to pick up premade red bean paste. Even if you don’t I’ve seen a bunch of guides online that you walk you through it. Also, haupia is probably horrible for me but it is quickly becoming my new favorite thing. Next time? Haupia with toaste coconut, mixed with nutella, and seeded with dark chocolate chips. A) I am going to make coconut filling immediately, to eat with a spoon (or, possibly, just my hands). C) Is there a savory version of this? My old roommate used to make something like this with scallions in the pancake part and…something yummy(?) in the center. A. I suspect you will. It’s pretty addictive. B. I got it from the one near Gardena. I’m sure there are other molds but the only ones I have seen are fish shaped. C. I have heard you can make a savory version. Up the salt, leave out most of the sugar, and change the filling. I read elsewhere that you can actually find ones that are filled with okonomiyaki which sounds fantastic. I mean, it really is a pancake… You could probably throw a sausage in there, drench it in syrup and have a breakfast hotpocket. Well, I had a great recipe to follow 😉 My fiancee loves your blog, I’m sure we’ll be cooking more from it soon. What’s the significance of the fish shape? Also: stuffed pancakes – genius.